At Hejny Rental, we rent a wide variety of party rental and tool rental equipment for homeowners, contractors, businesses, and organizations in the St. Paul metro area. We invite you to explore our website by searching by category to see just how many products we rent! Our rental inventory expands continually to meet the needs of our homeowner and commercial customers. Our most recent additions to our inventory can be viewed here. We specialize in making your projects easier and your parties more fun! Hejny Rental was started in the spring of 1954 with a cement mixer, trailer, and wheelbarrow. The decision to start an equipment rental business was made out of necessity. Robert Hejny, a successful cement mason, contracted polio in 1953 and was confined to a wheelchair. 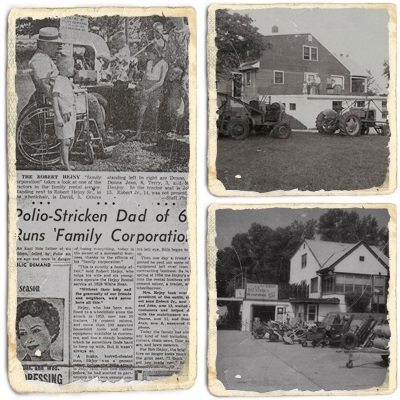 Upon the advice of a friend, Robert, his wife, Dorothy, and their children started renting his tools to local neighbors and contractors to pay the mounting bills. Growing up, the children waited on customers, answered phones, and helped their dad in the shop. It was truly a family corporation. Today, the family business is owned and operated by Dave Hejny. Customer Service is our main priority and we make sure that each of our customers has a enjoyable experience each time they shop at Hejny Rental. As a family-owned, independent equipment rental store, we believe we offer better service to our customers. Our employees are dedicated and knowledgeable in the equipment rental and party rental business. Seven of our staff have over 165 years of rental store experience at Hejny Rental. We are conveniently located northeast of St. Paul, in Maplewood. We are approximately 1 mile south of Highway 36 on White Bear Avenue across the street from Aldrich Ice Arena and the Goodrich Golf Dome. We serve St. Paul and the Twin Cities Metro Area. Our staff will be happy to assist you, just give us a call!